15 Great "Must Play" Sports ⚽ Genre iOS & Android Free & Real Slots. For players who are fond of the popular round ball game, they will find a ton of slot games that come with a soccer theme. For punters who are fond of tennis, they will also find a ton of slot games that come with a small yellow ball theme. The same applies to all other sports from rugby, cricket, and golf to boxing, MMA and professional wrestling and many others..
Well let’s started on 15 all-time great sports themed games that you can find in the market right now. Remember, all of the following are mobile friendly games hence you can enjoy them on any mobile device like and Android or iOS operating system for free or real money casino gaming. 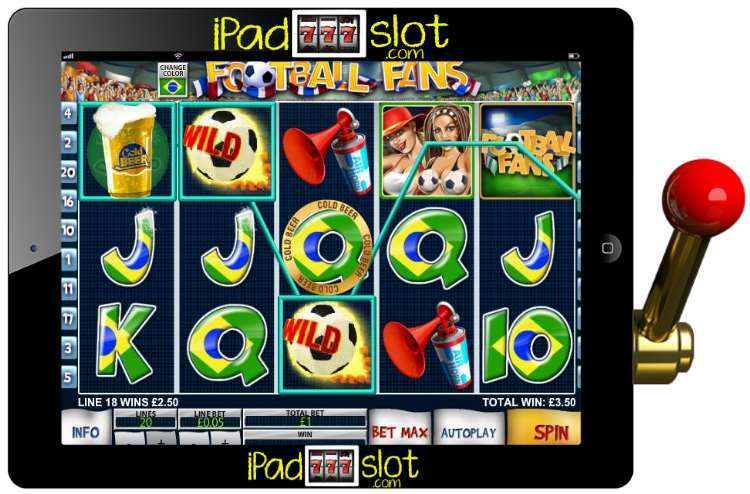 Well, they say football is the world’s most beautiful game so why not start with a football-themed slot. This online slot machine developed by Rabcat does have a title which reveals a lot of things irrespective of the fact that the title just possesses two words! First, from the ‘FC’, anyone who is into sports will know that FC is an abbreviation which stands for Football Club hence this slot is a football slot. Second, the ‘Win2Day’ in the title suggests that this slot is all about winning in the now not in the later; a nice thing to hear for players. When it comes to this online slot machine, the most impressive thing about it is the way in which the theme is brilliantly accentuated by the game graphics. Set inside a gigantic stadium, players will be spinning the reels whilst their eyes are mesmerized by the realistic background graphics depicting a colourful full packed soccer stadium. The symbols on the reels are all associated with football hence the player will not at any point be diverted away from the football theme; the corner flag acts as the wild while the black and white ball acts as the scatter symbol hence it is the key to triggering the game’s bonus features. To make the game even more impressive, when the payer turns the background sounds on, he will not hear the generic computer sounds that are a part of most other slots, rather, he will hear the loud roars and chants of the crowd in the stadium! When it comes to the profitability side, FC Win2Day does have a highly generous Free Spins Feature plus a fixed jackpot that can be hit at random regardless of the bet amount the player uses. FC Win2Day has five reels. Racing is loved by everyone. For those who possess the necessary skills to compete on the race track, they do enjoy their racing while on the track. However, even for those who do not necessarily have the talent nor skills to race, they still enjoy the thrill that’s brought about by racing. As such, realizing that everyone in this world is a racing fanatic, one of the world’s most respected game developer, Microgaming decided to come up with a racing themed slot game titled Monster Wheels. Truthfully speaking, Microgaming did not really expect Monster Wheels to reach the heights it reached but boy oh boy, the game has now literally become the trademark game of Microgaming in the car racing genre although Racing for Pinks is pretty good also. The reason behind this is simple, it is down to the brilliant work done by Microgaming mostly in terms of the game graphics. Though the game symbols come in a cartoonish feel, they are as realistic as animes can be thus making the game an appealing proposition for a lot of players. 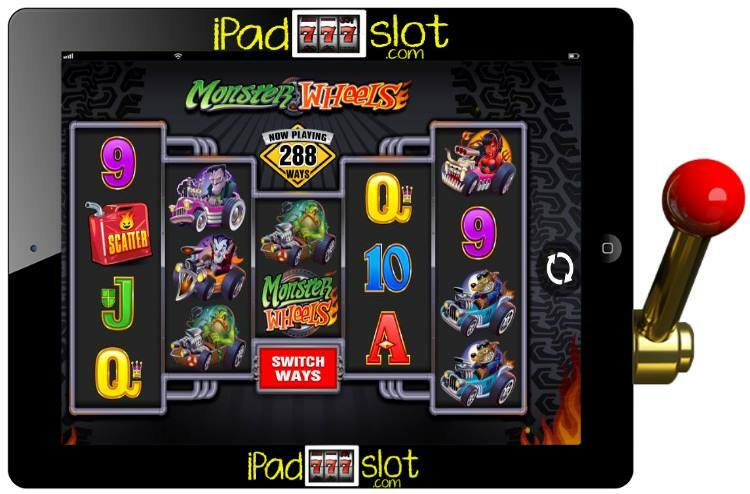 The unique reel set also makes this game a little bit different from other games hence this uniqueness plays a part in making Monster Wheels a great slot game. The reel set is designed in a 2-4-2-4-2 design. When it comes to the bonus features, Monster Wheels doesn’t offer much but players can enjoy the easy to trigger Free Spins Feature which is the only bonus feature of this slot. In all, Monster Wheels comes with 288 paylines. Cricket is known as the gentleman’s game. The reason being that cricket is a game that has a few if any contentious moments during a match (this despite being one of the longest sport in terms of match duration). However, when spinning the three reels of The Umpire Strikes Back slot, players ought to know that they will encounter a different cricket game. In this slot, instead of the umpire taking his place behind the wickets, he will actually be in front of the wickets, holding the bat and ready to take his shot! Incredible isn’t it. This rather unusual setup makes this online slot machine a must play for all cricket lovers in particular and all sports lovers in general. Apart from the theme brought out in a unique way, there are other things which make The Umpire Strikes Back a great slot game to play. Firstly, players ought to know that this slot’s paytable is right there on the main screen hence they will be able to know what they stand to win as they spin the reels; the hassles of looking for paytable information from hidden buttons is totally eliminated. Moreover, the game also has numerous bonus rounds just to add to the fun. There is the Umpire Strikes Back Bonus which is essentially a mini-gambling game, the Nudges & Hold Feature, Shifta Feature and the Let ‘em Spin Feature. The Umpire Strikes Back slot has three reels. Boxing is a game which is just like car racing in that it’s a sport loved by everyone. For those who possess the skills to enter the ring and fight, they find their happiness in fighting. For those who do not possess the skills to enter the ring and fight, they find their happiness in seeing professional boxers change blows in an all action-filled fight. In light of this, Fugaso decided to develop a boxing-themed slot game. The background of this online slot machine depicts the inside of a boxing arena and on either side of the reels are two boxers watching on as the reels spin. The beauty of this online slot game is that the reel section is transparent meaning that players will be able to see the stunning background graphics while spinning the reels. The symbols on the reels themselves are all associated with boxing (from combat gloves to belts) hence the player will not at any point be diverted away from the boxing theme. 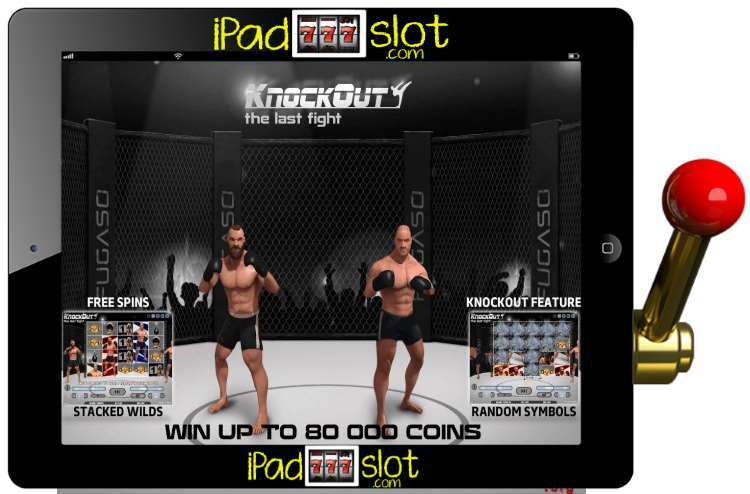 While the cool graphics makes this slot a great slot app, the addition of a bonus round would have made it the perfect slot, unfortunately, there is no genuine bonus round to talk about when it comes to Knockout: The Last Fight slot game. 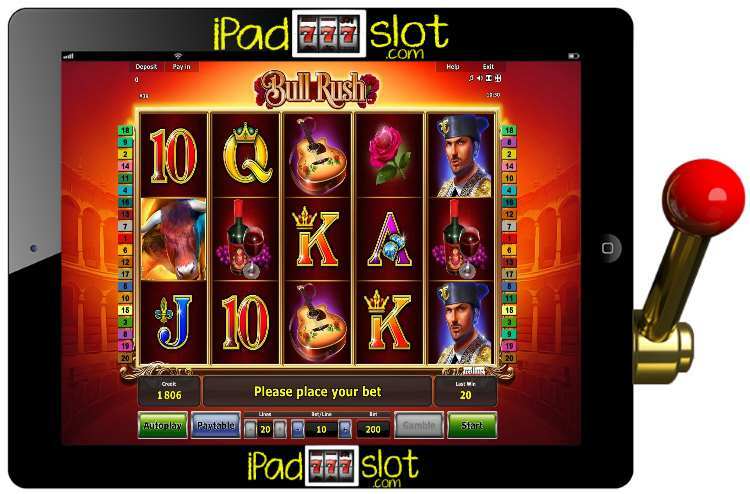 This online slot machine comes with five reels and 40 paylines. 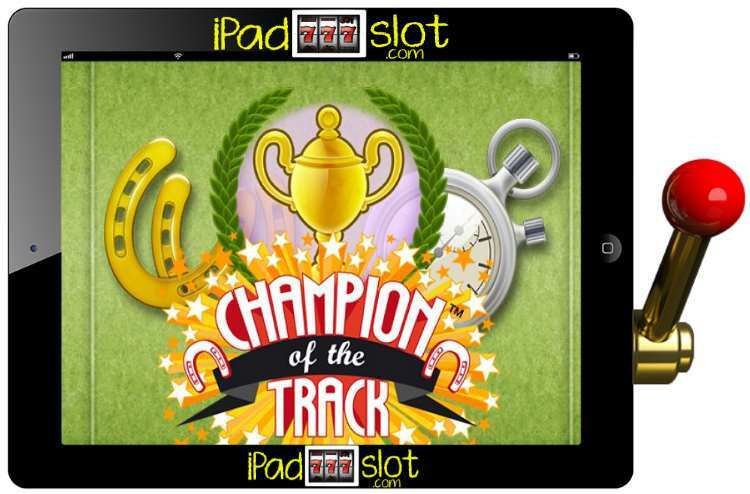 Champion of the Track is a truly unique sport themed slot from Net Entertainment. This online slot machine does fuse two gaming elements i.e. slots and a board game to bring one truly exquisite slot. When it comes to game play, this slot is played just like any other slot as players simply have to hit the Spin button (for manual spins) or the AutoPlay button (for automatic spins). However, away from the slot elements, there is also a board game feel to this game as the background graphics depict a horseracing track which is designed in such a way that it replicates a board game. 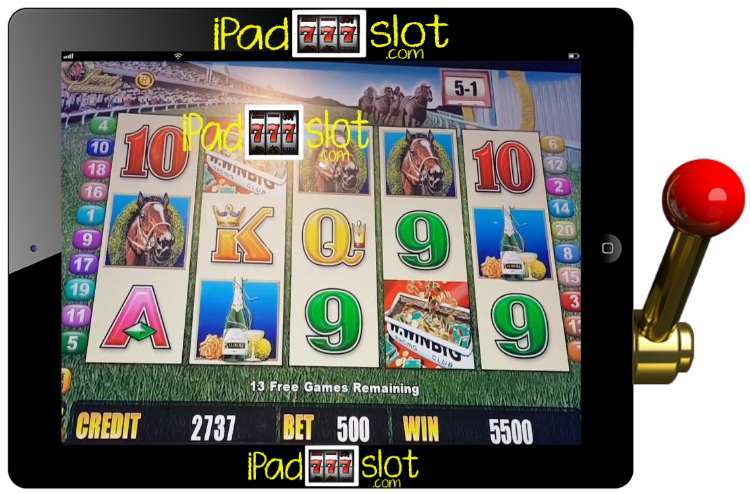 Coming with a horse racing theme, plays spinning the five reels of this slot app you can expect to encounter different jockeys’ horseshoes, clocks and trophies among other tools associated with horse racing. Away from the game graphics, another thing which makes Champion of the Track an even more enterprising slot is the fact that players can actually take to the racetrack themselves! Yes, you heard that right, when playing this slot, you can actually become a jockey and race your own horse against three others! In order to do this, all one needs to do is simply to trigger the ‘A Day at the Races Bonus Game’. Apart from this bonus feature, there are two other bonus rounds which are the Career Bonus and the Free Spins Feature. Champion of the Track slot has five reels and 30 paylines. Ice hockey is one of the world’s most action-packed game; played on a small pitch which is freezing ice cold with two teams of 6 oversized men (or women) on each side who slam and bash on each other all in the hope of trying to hit a little puck into a little goal. This high octane sport is loved by many not just for the sports action but also for the traditional ‘fights’ that are often part and parcel of any match. To give lovers of ice hockey something to look forward to when they decide to try out casino games, Playtech decided to create this ice hockey themed slot. 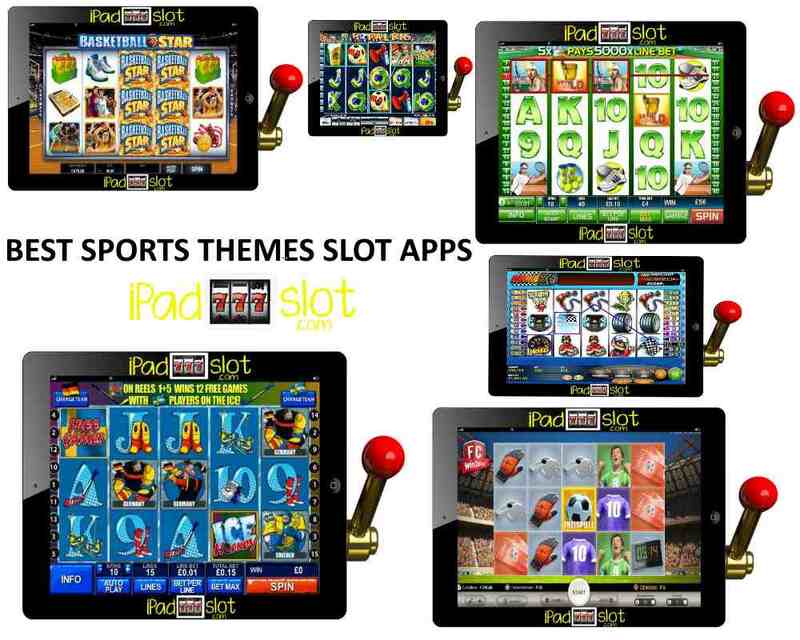 With this slot app, ice hockey fans will be able to enjoy their favourite sport i.e. ice hockey while at the same time enjoying one of the easiest casino game i.e. slots. The theme of this online slot machine makes it a great proposition for all players but what’s even more impressive are the bonus features available. Firstly, there is the Team Selection Feature which allows players to choose the type of players they want to see on the reels. Secondly there is the Free Spins Feature and lastly, there is the Pass the Buck Bonus Feature. 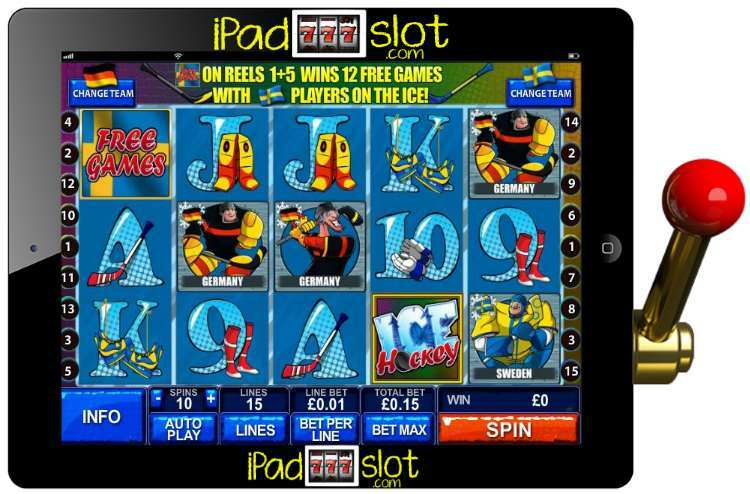 Ice Hockey slot game comes with five reels and 15 paylines. Bullfighting is a sport which divides opinion of many. To some, the sport is just a sport i.e. those who are pro-bullfighting see nothing wrong with the sport. However, to some, the sport is too extreme, dangerous and cruel to the animals involved is one good reason to ban the sport completely, to say the least. Irrespective of the side that you fall into, there are some great reasons for and also great reasons against. As such, as long as bullfighting is regarded as a sport, then we also classify it as one. In this Novomatic powered sport themed slot game, the players are virtually transported to the inside of a bullfighting arena. It is from the inside of this arena that players get to spin the game’s five reels. The symbols on the reels resemble tools that one would likely encounter when watching a bullfighting match i.e. a matador, guitars, wine bottles as well as pink roses. While the theme of this slot makes it a great game to try out, players also need to watch out for the highly generous Free Spins Feature where players stand a chance of winning random multipliers of up to a 16x line bet multiplier. Bull Rush has five reels and 20 paylines. 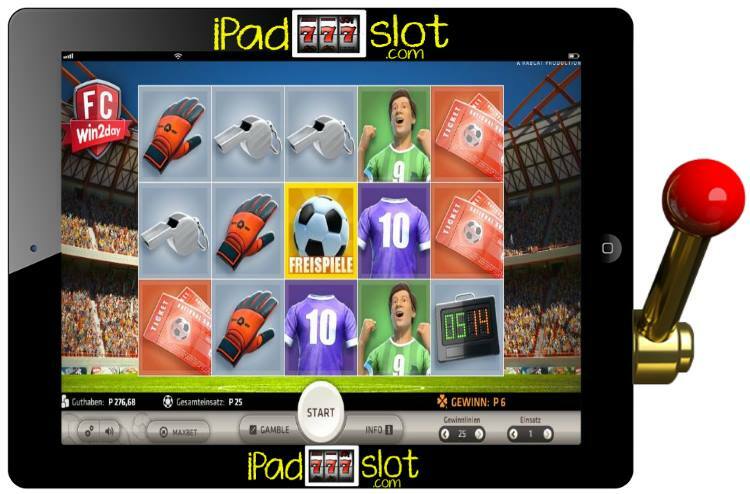 Playtech powered Football Fans is a sport-themed slot game with a difference. While other slots discussed above all target the sports specifics of different sporting disciplines, this online slot machine particularly focuses on the people who make any sport popular i.e. the fans. As such, when spinning the five reels of this online slot machine, players can expect to encounter different football fans. In fact, the background graphics of this slot depict the inside of a packed football stadium hence players get to see and to experience how it feels to be a fan. Various fan regalia such as hats as well as intricately designed traditional poker symbols resembling the flags of different nations (possibly where the fans hail from). Apart from the theme which is brilliantly accentuated by the colourful and exquisite graphics, players can also look forward to two incredible bonus features i.e. The Grab a Beer Feature and the Penalty Kick Feature. Football Fans slot game has five reels and 20 paylines of soccer slots fun. Formula X is the game for all Formula One lovers as well as any other players who prefer playing slots that come with a car racing theme. There is really no need to outline what Formula One is as its one of the most popular sports in the world. 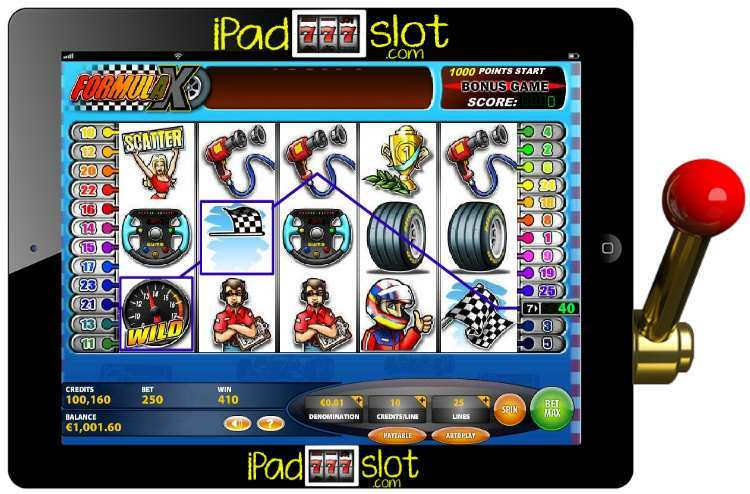 When spinning the five reels of this IGT powered online slot machine, players will be able to see up close what goes on before the start of any Formula One race. This game also can be found under the Spielo software name brand at online casinos. Apart from the theme of the game which is brilliant, to say the least thanks to the 3D style graphics employed in bringing it out, this online slot machine also offers a fixed jackpot. The beauty of this fixed jackpot is that it can be hit by anyone regardless of the bet amount the player is wagering with for as long as the payer manages to land at least three jackpot symbols. The jackpot prize pool is a cool 100x line bet multiplier. What this simply means is that the higher the wager, the more the player stands to win. Formula X comes with five reels and 25 paylines of hi octane fun. Tennis is one of the most demanding sports in the world. Tennis players have to be strong, agile and very athletic in order to become superstars. While this is the case for players, it’s a different ball game when it comes to spectators, all they need is to concentrate on what they are seeing as they cheer on their favourite players. The same can be said of players playing this tennis-themed slot from Playtech, players need not be agile nor athletic. With that single skill, one will surely reap huge benefits in this aesthetically appealing slot. The good thing about Tennis Stars slot is not just restricted to the theme and game graphics but protrudes to the bonus features that come with this slot. Namely, the bonus features are as follows: Championship Bonus, Free Spins Feature and the Gamble Feature. 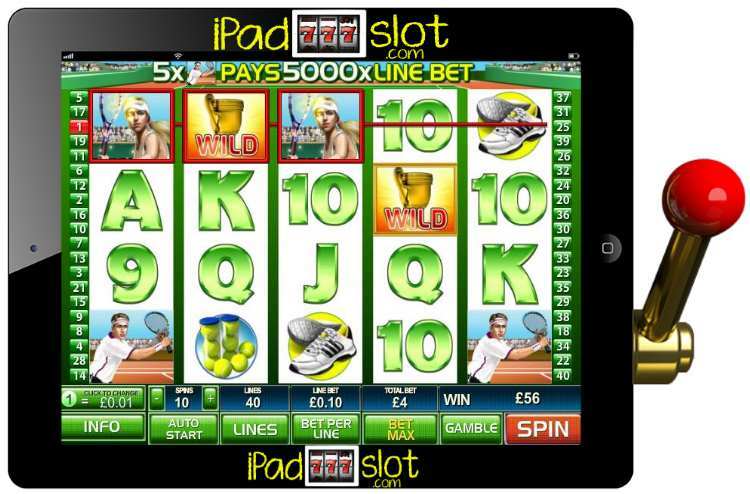 Tennis Stars slot game has five reels and 40 paylines bouncing ball slot app action. 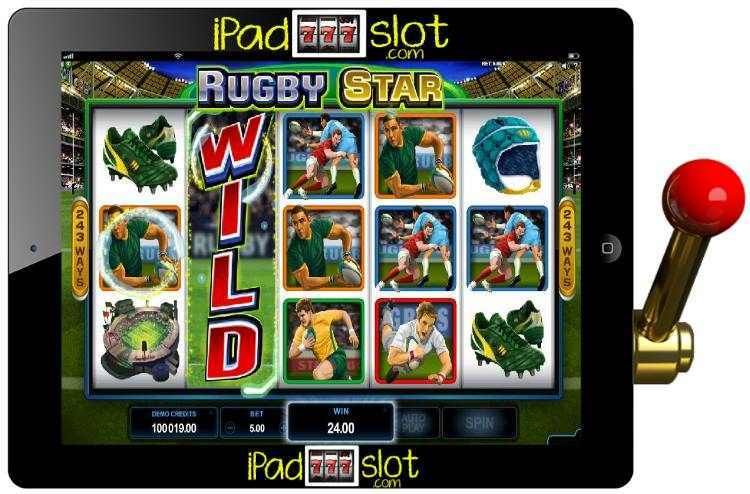 The Rugby Star slot machine has 5 reels and 243 ways to win some awesome sports themed pay-outs. From Microgaming it has many fun, entertaining and cracker bonus features. The Rugby Star symbol is the wild and it will stack on reels 3, 4 and 5. There is also a random feature connected with Wilds. It is called the Wild Pass Feature and according to it reels 2, 3 or 4 can be randomly morphed into wild reels and you can win up to 2 wild Reels. The ball image is the scatter, which has big payouts and it activates the free spins bonus. Depending on the number of scatters you get, you can win 15 to 25 free spins on the rolling reels and up to 10x multiplier of your prizes. Rugby Union is a popular ball sport that’s popular in countries like England, South Africa, New Zealand, Australia, France, Wales, Ireland, Japan and Scotland. This bounce the ball game from Microgaming comes with 243 ways to win plus the exciting rolling reels feature. You can activate up to 25 free spins by getting 3 or more scatters on the reels. The Rolling Reels feature causes all winning symbols to explode and the symbols above will roll down into play on the reels for even more wins. In addition, the wild shot feature is triggered in the Rolling Reels feature, entire Reels will explode, and new symbols will drop down on the reels, thus giving you even more chances to win. This game has all the feel of being right in the game and you can win up to 1,200,000 credits – how great is that! Dust off the rod and reel, grab a few beers, buy some bait and let’s head off for a tad of fishing action in this Aristocrat slot machine called Let’s Go Fish’n. 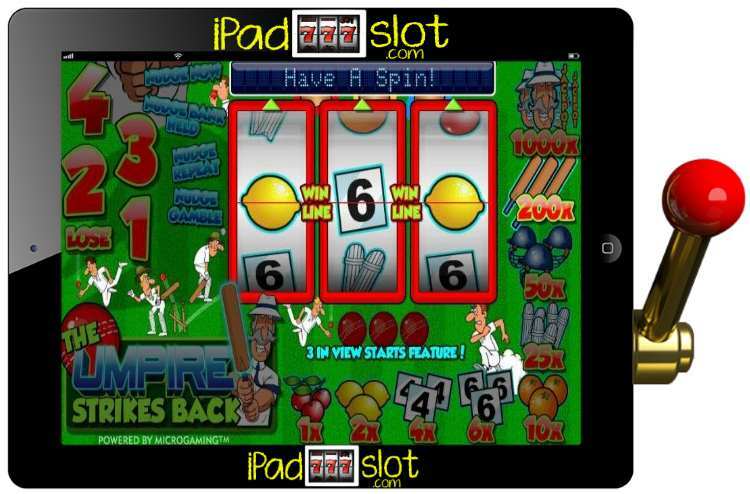 This has been a popular poker machine “pokie” game in Australia with players for many years. It’s a bit long in the tooth these days but it’s still a fun game to play if you can find it online or at your local casino. You can reel in the big ones in Let’s Go Fish’n, it comes with symbols like worms on a hook, seagulls, rod and bucket, fishermen and lighthouses. The slot has 5 reels and 25 paylines plus the fun fish’n “pick” feature and free spins bonuses. 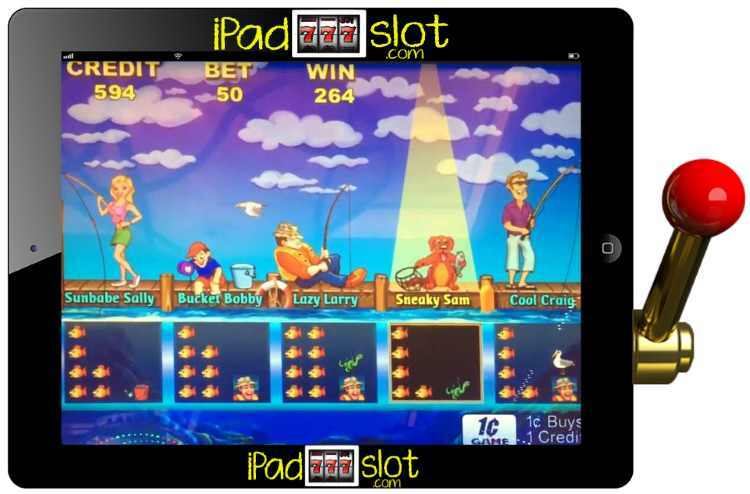 In the fish’n feature bonus you get to pick from characters such as Sunbabe Sally, Bucket Bobby, Lazy Larry, Sneaky Sam and Cool Craig. These characters fish for some big pay-outs on your behalf in this bonus. This feature is like the Where’s the Gold mining bonus feature with 5 various characters on the screen searching for pay-outs on your behalf. You might find a free version of Let’s Go Fish’n at the Heart of Vegas casino as they have all the best free Aristocrat slot game apps. The sport of kings comes to life in this Aristocrat slot machine called Spring Carnival. Will your beat the bookies or walk off the track without your shirt, probably the latter but who knows. Horse racing is the ultimate sport theme for a slot machine and the essence of excitement is captured in a day at the races at the Meadows track. The game symbols include bottles of bubbly, roses, bookie money bags, a lady, regular card suit symbols, horses, flags and jockeys. As per normal you get free spins plus a bookie reel ticker bonus that increases your winning odds, well if luck runs your way of course. This is an iconic slot machine and the similar version found in casinos around the world outside of Australia is called Ladies Day. We have not yet seen a free or real money online version of Spring Carnival pokies (Ladies Day) slots. 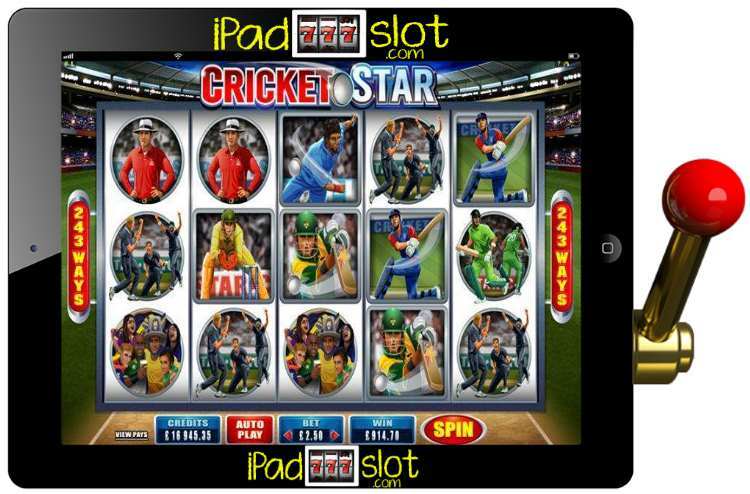 Will you go out for a duck and hit a tonne in the Microgaming sports themed slot app called Cricket Star, it’s another in the “Star” series of sports genre games by Microgaming. Don’t fret pet if you don’t know the difference between a short third man, long stop, extra cover or your gully as the Cricket Star slot requires no prior knowledge of this small round ball game. Just make sure that grumpy umpire does not raise his finger when you are at the batting crease. You get 243 ways to win plus rolling reels, multiplier trail bonus, wild wickets, scatters and free spins to rack up some nice scores on the board. Boring test cricket this is not so be prepared for something exciting in this game. So, grab your trusty bat and hit that ball into the outer for a six and hopefully some nice payouts in Cricket Star. Most casino players tend to be sports enthusiasts well that’s the men anyway. While it’s difficult to pinpoint the exact reason why this is so, its crystal clear and safe to say that you will not find anyone who is not fond of any sport playing inside the casino. It is against this background that software developers in a bid to satisfy the needs of all players decided to come up with a game theme which fuses two of the elements that are loved by players i.e. casino games and sports. 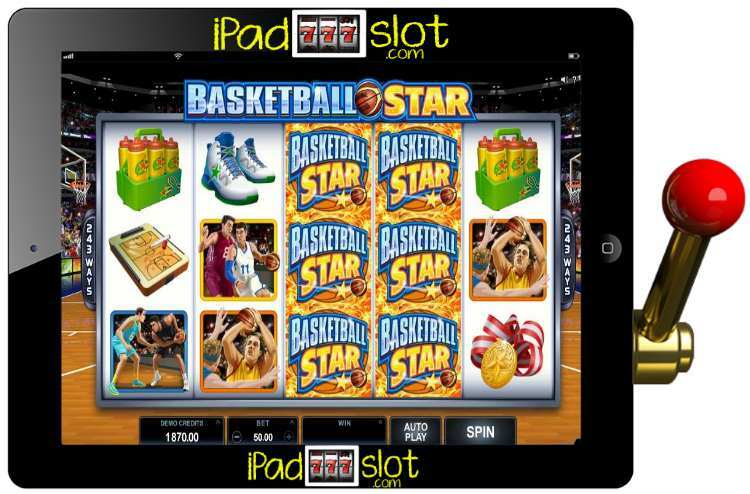 The end result being sport themed slot games that can be enjoyed across Android and iOS devices for free or real bucks with or without an app install. Sport themed casino slot games cut across different sporting disciplines. Therefore, one can safely say that there is everything for everyone regardless of the diversity in gamer’s ‘tastes’. What’s even more impressive nowadays is the fact that game developers are no longer just focusing on developing sport themed slots that cover the basics of any sporting discipline, rather, they are taking it a step further by creating games that are solely based on a particular tournament or competition such as the Wimbledon Grand Slam, Rugby World Cup and the UEFA Champions League among many others. In addition, game developers nowadays are also creating some sport themed slots which focus on prolific and legendary sporting stars from footballing legends such as Johan Cruff, Maradona and Pele to wrestling stars such as John Cena and Hulk Hogan among many others. You will find many sports themed games online with everything from baseball, cricket, Aussie rules, rugby union, grid iron, hockey, tennis, soccer, boxing, wresting and car racing themed into the slot games and more. You won’t find many sports themed slot machines in land casinos though, it’s an online sort of thing only.